The Book Group meets at 7.00pm on the first Monday of every month in the Undercroft of St Peter's Church, Seaview and at 10.45am on the first Wednesday of every month in St Mary's Church Hall, Brading. 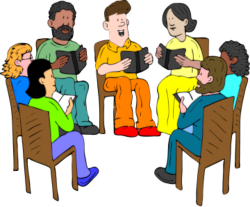 The book group is designed as a drop in discussion of the book of the month. The chosen book is advertised by email, on this web site and in the pew sheets. If you fancy having a look at the book just let Ali know and come along to the discussion. Open discussion is encouraged and we will be looking at a large variety of books in the areas of spirituality, theology, philosophy and culture. The books will be challenging, moving, demanding and sometimes ...incomprehensible! Our current book is 'That was the church that was’… how the church of England lost the English people.